Remote sensing applications in viticulture have been a research theme now for nearly two decades, becoming a valuable tool for vineyard management. Metrics produced using remotely sensed images of vineyards have yielded relationships with grape quality and yield that can help optimise vineyard performance. While valuable at the scale of precision viticulture, opportunities for spatial applications at the terroir scale are yet to be fully explored. The spatial scale of terroir analysis is different to precision viticulture and requires adaptation and new models of analysis. With the rising availability of high spatial and temporal resolution datasets, increasing computing power and advances in image processing software, the opportunities for vineyard interrogation through spatial analysis are increasing. Remote sensing and image analysis techniques that are becoming more accessible include: object based image analysis, spatiotemporal analysis, hyperspectral analysis and topoclimatology. Each of these techniques has potential for development within a viticulture and terroir context. 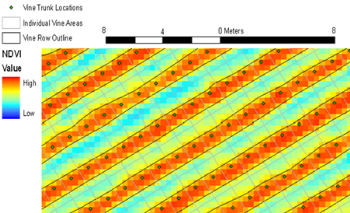 This paper investigates the use of these techniques in a spatial science framework at various scales and identifies potential opportunities for their application in a terroir context, particularly in terms of terroir zoning.